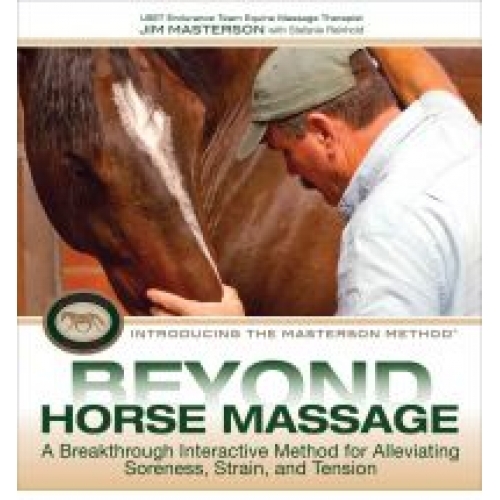 Urban Horse Promotes Beyond Horse Massage DVD - Introducing the Masterson Method with Jim Masterson. "Jim Masterson - USET Endurance Team Equine Massage Therapist, illustrates 'The Masterson Method' an innovative form of bodywork that relaxes the horse's body and relieves his muscles, connective tissue, and structure of deep stress and pain. Through the gentle and light manipulation of targeted Release Points: the movement of joints or junctions through a range of motion in a relaxed state; and studied observation of the horse's responses - his reactions tell you what he is feeling. You'll open doors to improved health and performance while enhancing communication and your relationship along the way. Jim Masterson, Equine Massage Therapist for the 2006, 2008 and 2010 USET Endurance Teams, and for equine clientele competing in FEI Wrold Cup, Pan American, and World Games competitions. First became interested in equine massage in 1997. Since then, he has developed an effective method of bodywork that all riders can learn to use to improve their horse's performance while at the same time opening new levels of communication and trust with their four-legged partners. Jim currently works on 500-600 horses a year on the US Hunter-Jumper show circuit, including top equine competitors in events such as the USEF and Maclay Medal series, FEI Grand Prix, Nation's Cup, plus Pan American and World Cup jumping events. He helped members of the USET Singles Driving Team prior to the 2010 Chamionships in Italy. Jim teaches Masterson Method TM seminars and advanced courses to horse owners, trainers, and therapists worldwide."